As anticipated, Buckingham Palace released an update on plans for the birth of Baby Sussex this morning, confirming Harry and Meghan have taken the "personal decision" to keep the arrival of their first child as private as possible. "The Duke and Duchess of Sussex are very grateful for the goodwill they have received from people throughout the United Kingdom and around the world as they prepare to welcome their baby. Their Royal Highnesses have taken a personal decision to keep the plans around the arrival of their baby private. The Duke and Duchess look forward to sharing the exciting news with everyone once they have had an opportunity to celebrate privately as a new family." 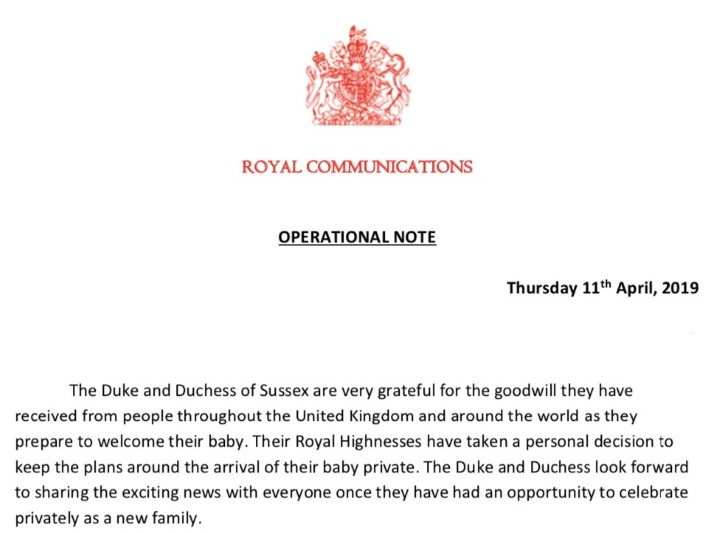 Let's do a run down of what we do know.... Reporters were informed (via direct contact with the Palace and I expect a separate operational note included with the above press release) the media will be informed when the Duchess goes into labour and subsequently told when Baby Sussex is born. 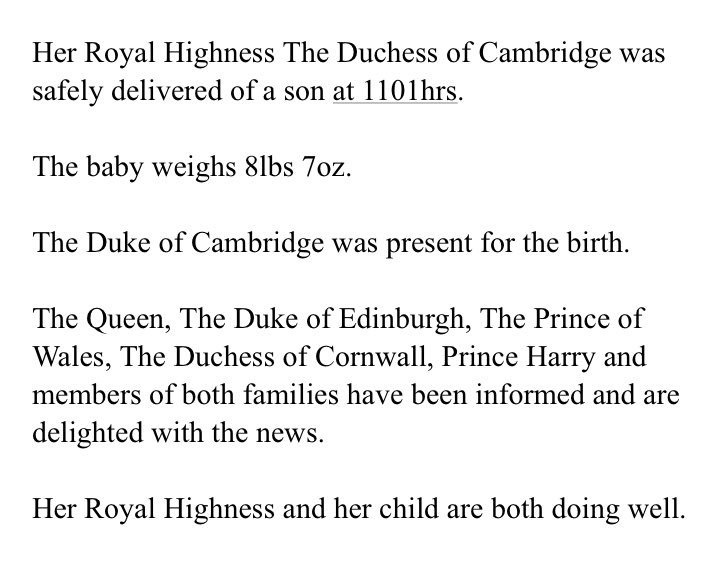 Here's a look at the statement which was released after the Duchess of Cambridge gave birth to Prince Louis last April. I imagine we'll see something very similar. When will see our first glimpse of Baby Sussex? 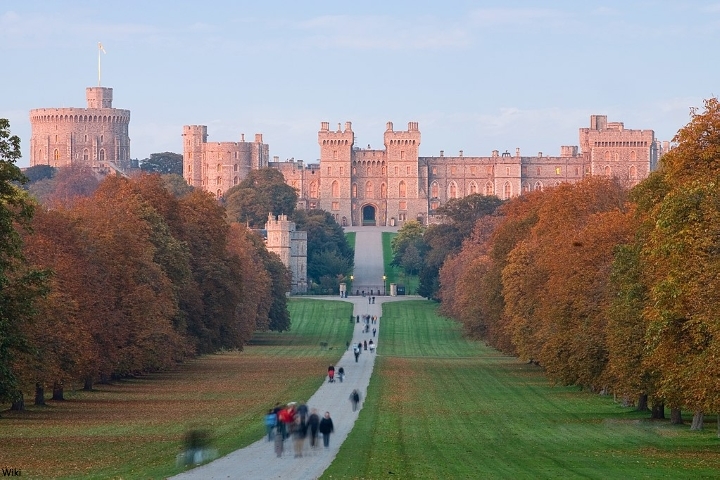 We won't see the traditional photos on the steps of the hospital, however reporters were told the couple are planning a small photocall at Windsor about two days after baby arrives. I understand a media pool will be present and images will be shared with photo agencies and news outlets around the world. It's a good compromise; Harry and Meghan will be able to enjoy their first days as parents in private, but the photocall will ensure the public are a part of the celebrations. The images will be used time and time again throughout the child's life and remembered as his//her official introduction. Is it possible Harry and Meghan will elect to share a personal snap before the official photocall? Below, a salient point from Rebecca English. I think the couple grappled with striking the balance between their desire for privacy and their wish to acknowledge the enormous public interest. It's a difficult situation because they are full-time members of the royal family; they will be central players during Charles' reign and eventually William's. When the Prince of Wales ascends to the throne, it's very much going to be a case of Charles, Camilla, William, Kate, Harry and Meghan in key senior roles, representing the BRF at home and abroad and undertaking the monumental task of modernising the monarchy and sustaining the growth of the institution in the 21st century whilst ensuring they stay true to time honoured traditions. Yet, it is highly unlikely, the Sussex children will have any future roles as working royals. Charles' plans for a streamlined monarchy are well documented. I believe they have been discussed at length within the family. Someday in the future, we'll have the Cambridges, Sussexes, Prince George, Princess Charlotte, Prince Louis and their spouses as working royals. Although Baby Sussex will be seventh-in-line when he/she is born, that position will change with the passage of time and it makes perfect sense for Harry and Meghan to establish the fact their children's lives will be private from the moment they are born. 'According to King George V’s 1917 decree, only the oldest son of the Prince of Wales’s oldest son (so Prince George) was entitled to be styled His Royal Highness and a Prince. But in December of 2012, the Queen issued new Letters Patent, which declared that all of William and Kate's children would hold the title of HRH and would be styled as princes and princesses. “The Queen has been pleased by Letters Patent under the Great Seal of the Realm dated 31 December 2012 to declare that all the children of the eldest son of The Prince of Wales should have and enjoy the style, title and attribute of Royal Highness with the titular dignity of Prince or Princess prefixed to their Christian names or with such other titles of honour,” reads the official statement. At this point, that ruling does not apply to Prince Harry's children, and so if it's a boy, he will be styled as Earl of Dumbarton, and if it's a girl, she will be styled as a Lady similar to how Lady Louise's title is currently styled. According to Koenig, “there is a loophole. The Letters Patent does not refer to what would happen if great grandchildren become grandchildren in the male line.” For that reason is why Koenig is sure The Queen will issue them before the birth. Should the children be born after Charles is king, those children will be styled as grandchildren of the monarch. 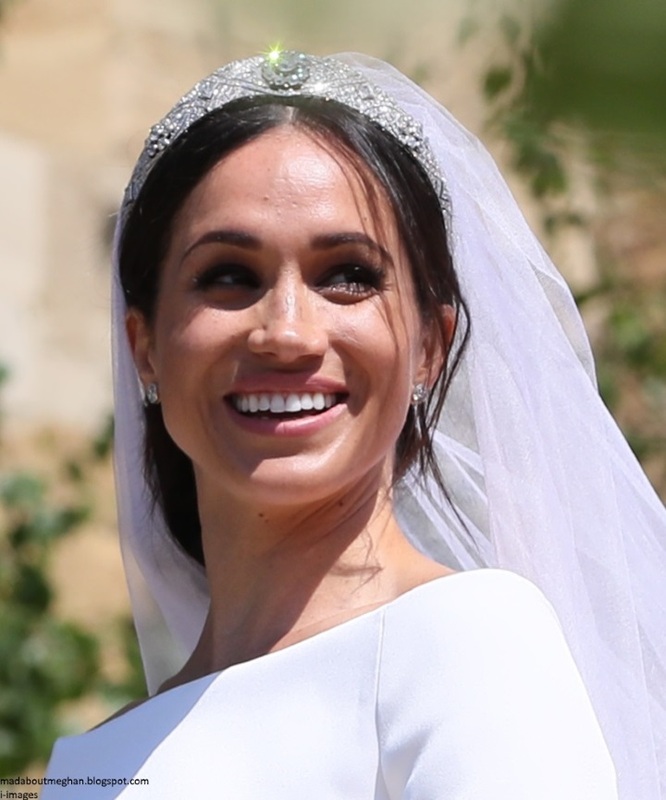 'Meghan is expected to have a midwife-led home birth at Frogmore Cottage in Windsor, the new home she shares with Prince Harry on the Berkshire estate. She wants to follow in the footsteps of the Queen, who was born at the Mayfair home of her grandparents and gave birth to all four of her children at either Buckingham Palace or Clarence House. My first thought when I heard the news was how fitting it is for the official photos of Baby Sussex to be taken at Windsor. Harry and Meghan have many happy memories of spending time there during the early days of their relationship. They chose Windsor for their official engagement photoshoot and of course were married at St George's chapel. They are now settling into their home, Frogmore Cottage, on the estate. I imagine the christening will be held at St George's in June or July. Happy Sunday, I'm just popping in for a quick post. 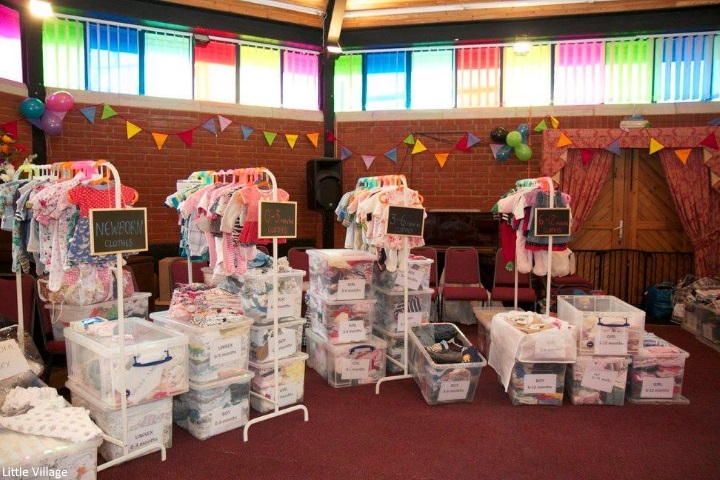 'What an incredibly special surprise the grassroots led #globalsussexbabyshower was last Sunday! The Duke and Duchess of Sussex are immensely grateful for the outpouring of love and support in anticipation of the birth of their first child. In lieu of sending gifts, the couple have long planned to encourage members of the public to make donations to select charities for children and parents in need. If you already made a donation, the couple send you their greatest thanks. If you are thinking about it, they ask that you kindly consider the organisations they’ve selected, which we will highlight here over the next few days. It was fascinating to see the couple highlight their four chosen charities and their reasons for selecting them over the weekend. 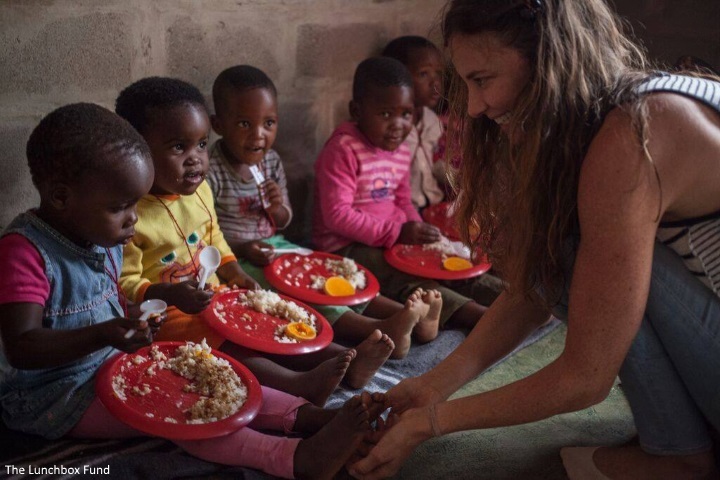 The Lunch Box Fund supports vulnerable children in South Africa to get the education they need to escape a life of poverty by providing a nutritious daily meal to schoolchildren who would otherwise go hungry. It was important to the couple to choose a Commonwealth country. "As President and Vice President of The Queens Commonwealth Trust, The Duke and Duchess of Sussex are committed to supporting the children and communities of the 53 commonwealth countries around the world." More from The Lunchbox Fund "The first five years of a child’s life are critical for their physical, social, emotional and cognitive development. 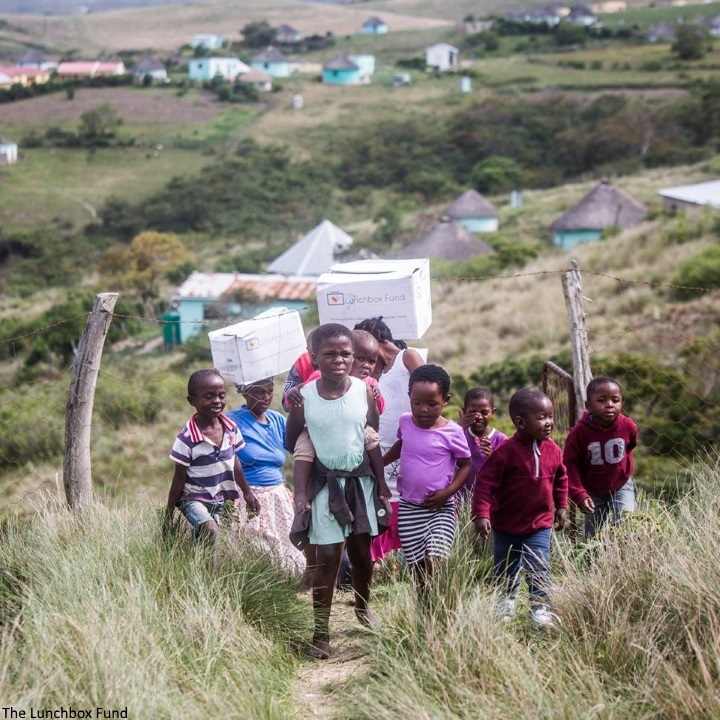 The ‘essential package’ of integrated ECD services in South African policy covers the five pillars of: Social Services, Maternal and Child Health Interventions, Support for Primary Care Givers, Stimulation for Early Learning, and Nutrition Support. The Lunchbox Fund seeks to address two of these five pillars – Nutrition Support and Stimulation for Early Learning – through spearheading nutrition provision in ECDC and playgroups offering quality educare across the country. Investing resources to support and promote optimal child development from a young age yields compound dividends into adulthood, and contributes to a country’s truly sustainable development." If you wish to donate, you can so by visiting their website here. Next, the couple introduced a charity they've been supporting behind-the-scenes; Little Village. 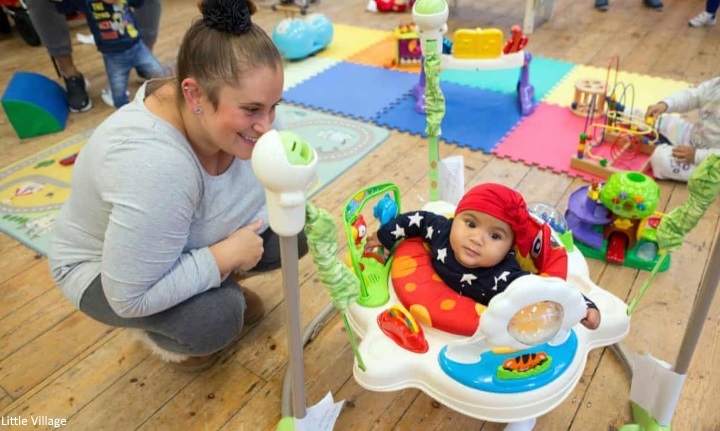 More from Sussex Royal: "Similar to a food bank, Little Village is for clothes, toys and essentials for babies and children up to the age of five. 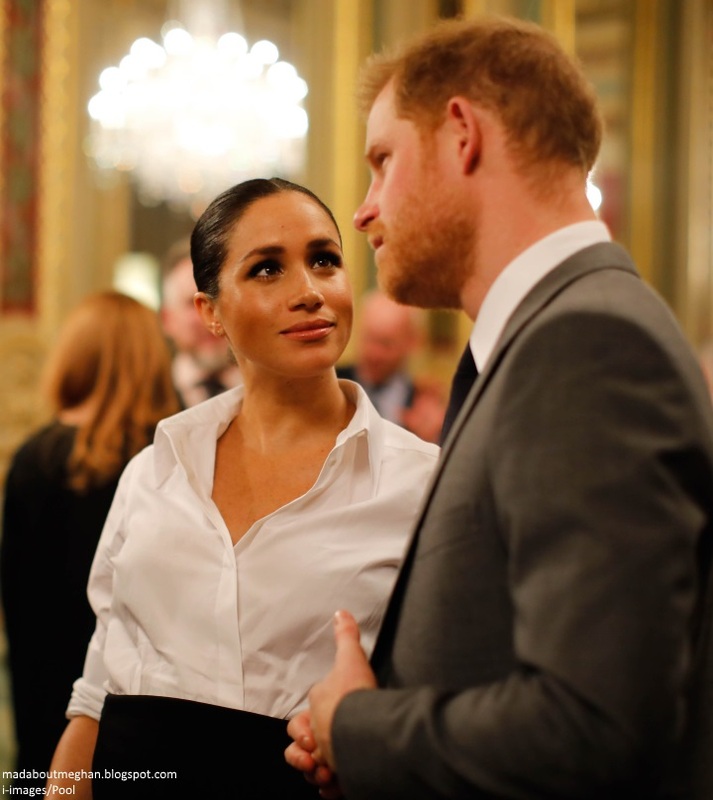 The Duchess of Sussex became aware of the organisation last December and strongly believes in their community ethos and goal to ensure every parent and young child have the necessary supplies and support they need. The couple have made private contributions in the last few months, and are excited to share this special organisation with you." 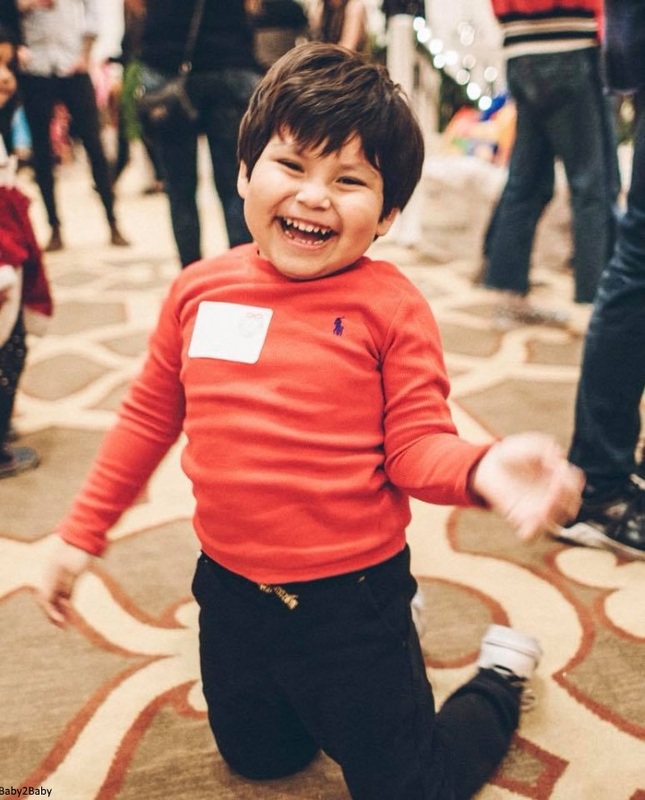 Little Village aim to one day ensure no child grows up in London without proper essentials including bedding, cots and clothing. 40% of the families they support do not have a safe place for their babies to sleep. Over the past three years, they have provided over 1000 cots and beds. They are entirely reliant on public donations for help and families in local communities supporting other parents in need. They have been "completely astounded" by the reaction from the public. 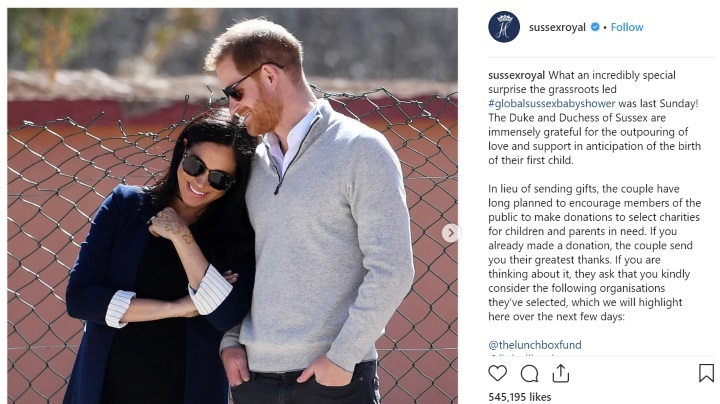 Sophia Parker, Chief Executive of Little Village said: “We’ve been completely astounded by the response we’ve received since being mentioned on the Duke and Duchess’ Instagram account. We’ve received messages and donations from as far afield as Australia, Texas and Hong Kong, it’s fantastic to think that people across the world appreciate our work. We’re a very small charity, so support like this is crucial. We often see families whose babies are being forced to sleep on cushions on the floor and children with shoes two sizes too small." If you wish to donate, you can so by clicking here. Little Village also shared a list of items they need. Harry's patronage WellChild was naturally included on the list. WellChild is the national UK children's charity helping to get seriously ill children and young people out of hospital and home to their families. Harry has been incredibly touched by the "inspirational" children and young people he's met since he became Patron in 2007. Speaking about their courage he said: "Many of the children and young people WellChild support have been dealt the hardest card imaginable in life, and yet their courage inspires the most incredible strength in those around them." 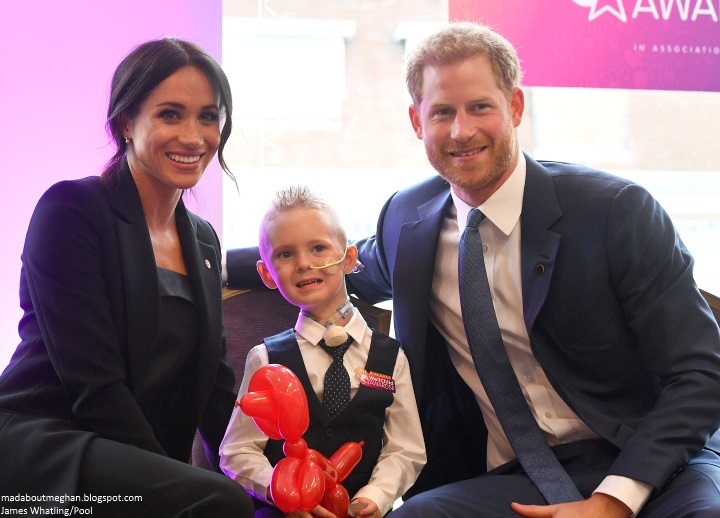 Meghan became part of the WellChild family last year when she joined Harry for their inspirational awards. Harry and Meghan's spokesperson said: "For those who have inquired, The Duke and Duchess of Sussex ask that you consider supporting WellChild and three other select charities in lieu of sending baby gifts for their upcoming arrival." If you wish to donate you can so by clicking here. 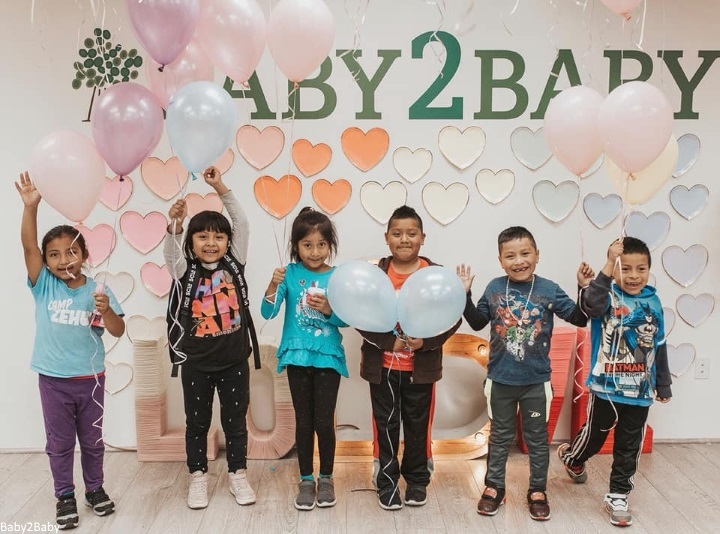 Last but not least, it's Baby 2 Baby, a charity providing essential necessities to children up to 12 years old in Los Angeles. In addition to supporting Harry's patronage, a London charity and an organisation based in a Commonwealth country, it was important to Meghan to honour her roots. Sussex Royal wrote "As a native of Los Angeles, the Duchess of Sussex wanted to include a locally based charity from her hometown that helps children and parents in need." More from the charity: "In the last 7 years, Baby2Baby has distributed over 50 million items to children in homeless shelters, domestic violence programs, foster care, hospitals and under served schools, as well as children across the country who have lost everything in the wake of disasters." Their tireless efforts have made a significant impact. If you wish to donate, please click here. I thought mentioning the #GlobalSussexBabyShower, a wonderful gesture and acknowledgement of the outpouring of support and good wishes they have received. It's obvious they both gave their own chosen charities a great deal of thought, each one does outstanding work and in addition to donations, I cannot think of a more appropriate use of their new social media platform than to bear a spotlight on important organisations. Speaking of Instagram, I've followed in Harry and Meghan's footsteps and finally created a page for Mad About Meghan, click here if you would like to follow! The royal reporters do expect to hear details regarding Baby Sussex in the coming days. I imagine the couple are hoping to keep it as private as possible, hence the later than expected announcement. Since our last post, the Sussexes have well and truly taken Instagram by storm. As of writing this post, they have amassed 3.6 million followers on @SussexRoyal. According to the Guinness World Book of Records the account has broken the record for the fastest time to reach a million followers - in just 5 hours and 45 minutes. The account has begun to cover Harry's engagements too, including tonight's appearance at the premiere of Netflix's Our Planet. 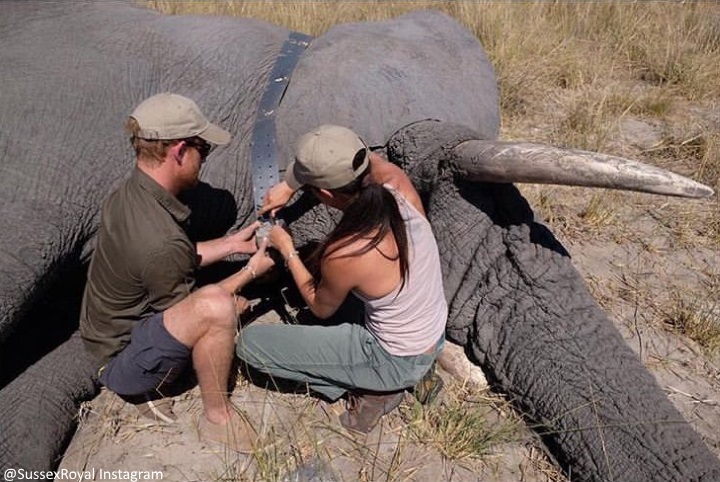 In an unexpected treat, the post included a previously unseen photo of Harry and Meghan from their 2017 trip to Botswana. 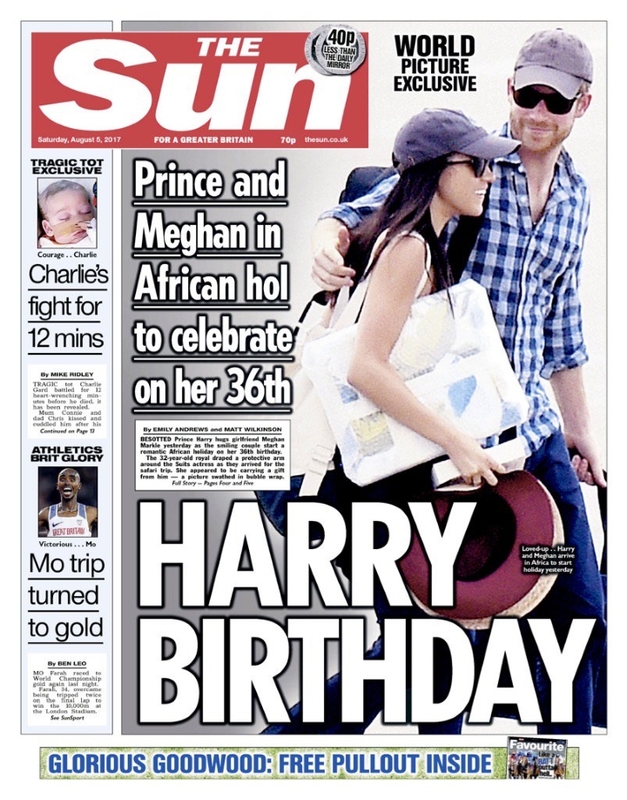 To mark Meghan's 36th birthday, she and Harry travelled to the African country. At the time, The Sun reported: "Obviously he wants to show Meghan what an amazing place it is and create new memories together. Harry’s done a lot of conservation work in Africa with endangered elephants and black rhinos and he’ll show them to the woman he wants to marry." 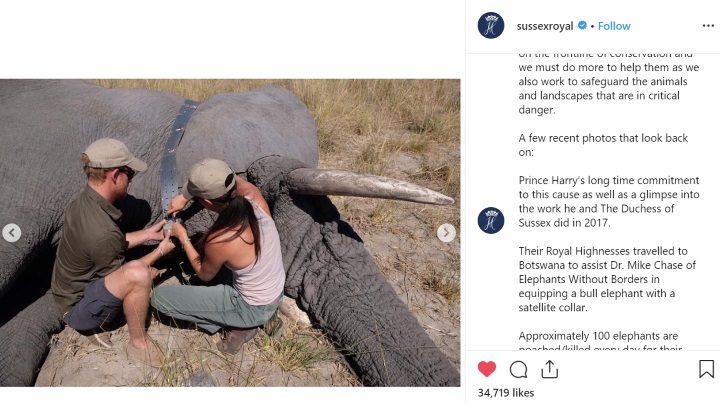 I've heard several reporters say Harry and Meghan take their passions and work with them wherever they go and during that trip to Botswana, just months before there engagement was announced, Harry took the opportunity to introduce his future wife to an area he cares deeply about. 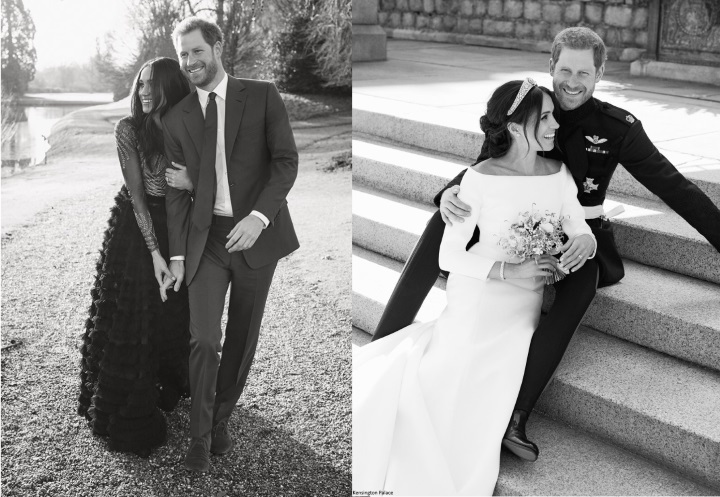 We've chatted before about the fact we're constantly learning about Meghan's charitable endeavours before the wedding and now thanks to their social media platform, we're gaining a little more insight into their time together before the wedding. I had hoped @SussexRoyal would offer a slightly more personal take on their roles, and judging by their first posts it appears that's going to be the case. 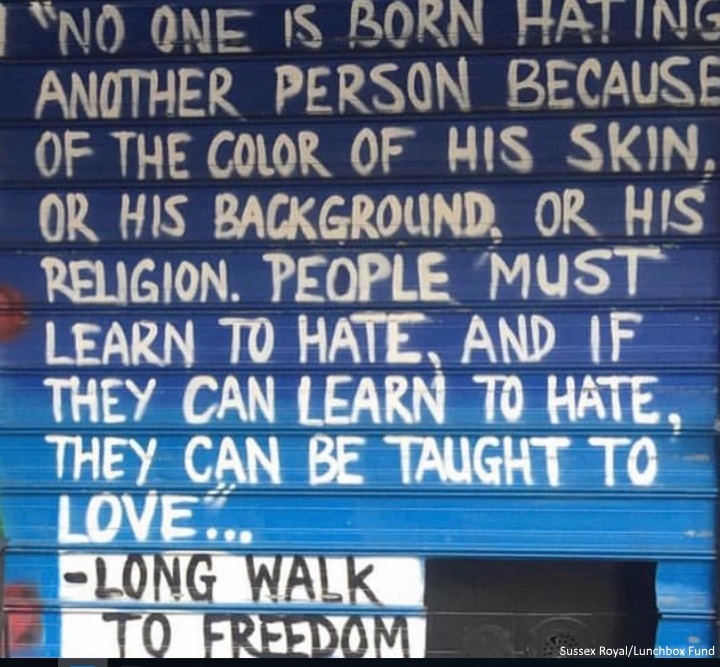 I expect we're going to see an incredibly vast wealth of work from them in the coming years, and using social media allows them to connect directly and share the causes that mean so much to them. The couple spent time assisting Dr Mike Chase of Elephants Without Borders in equipping a bull elephant with a satellite collar. On the Instagram post they added: "Approximately 100 elephants are poached/killed every day for their ivory tusks. Using satellite technology allows conservationists to track their critical migratory patterns and to protect them and the local communities from human wildlife conflict. The elephant pictured was sedated for just 10 minutes before he was up and back with his herd. Tracking his movements has allowed conservationists to better protect him and other elephants and ensure heightened protection for these beautiful creatures moving forward." 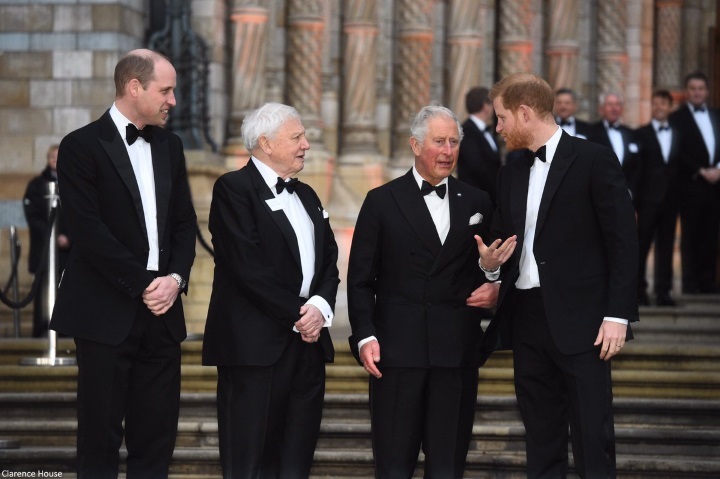 Below, Charles, William and Harry with Sir David Attenborough at the Natural History Museum tonight. Charles has tirelessly campaigned on environmental issues for over fifty years and long warned of the irreversible effects of climate change before they were commonly known. It's going to take a multi-generational effort to begin to tackle the problem. Tonight, Charles said: "I must say it has given me great pride to see how regularly my sons have taken up the causes of my interest. When they were much younger I never thought they were paying any attention to anything I was saying. But when I turned 70 last year, to my absolute astonishment it appeared that they had. My sons are very keen to remind me that we know what the problem is - we need to heal the environment and our society." "The Duke and Duchess of Sussex have moved out of Kensington Palace and into their new home. The couple are now living in Windsor, at the house they have refurbished on the Frogmore Estate. They’ve overseen development work at the house - and it’s thought they’ve created larger living areas by removing several internal walls." 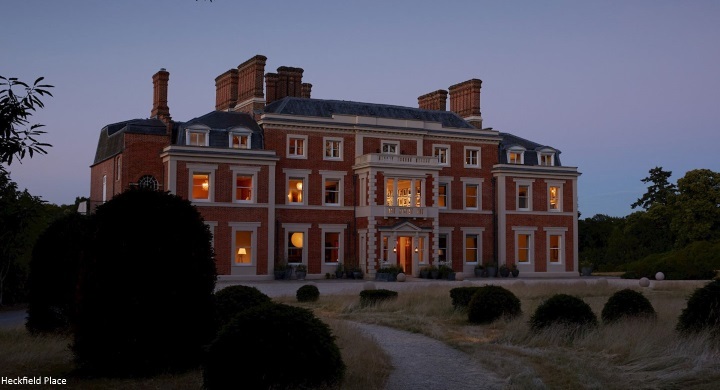 Emily Andrews reports Harry whisked Meghan away on a romantic four-night stay at the luxurious Heckfield Place in Hampshire as they waited to move into their new home. Apparently they enjoyed long country walks and open fires; it's likely their last break before they welcome a new addition to their family. 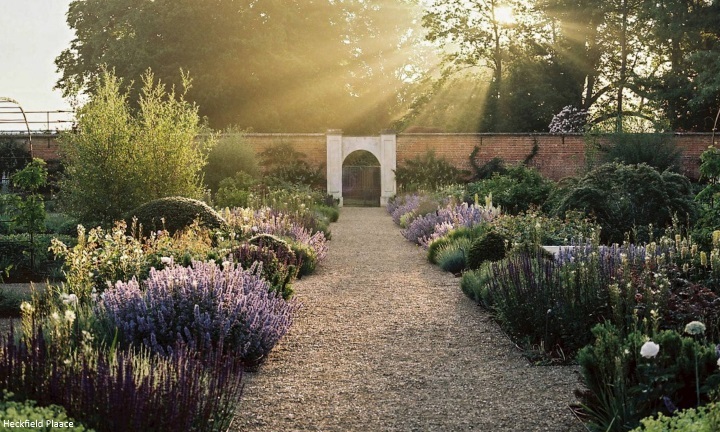 Heckfield is described as "a country haven, sculpted over centuries by ancient heather, woodland, gardens and meadows". 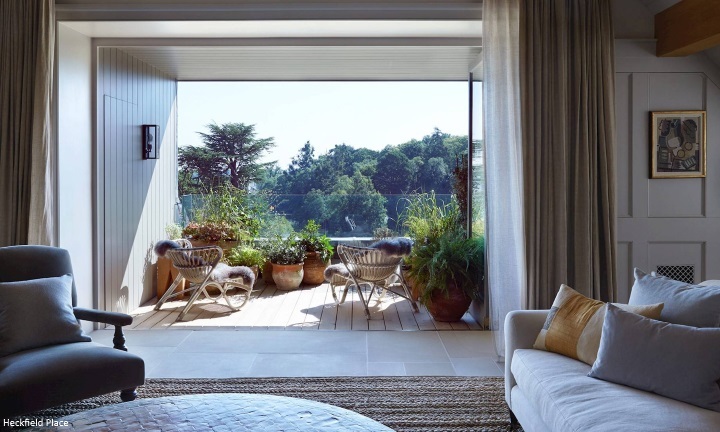 More from Heckfield: "At the heart of the estate, the Georgian grandeur of the house quickly becomes intimate and familiar; its rooms and spaces re-imagined with an unmistakably contemporary feel. 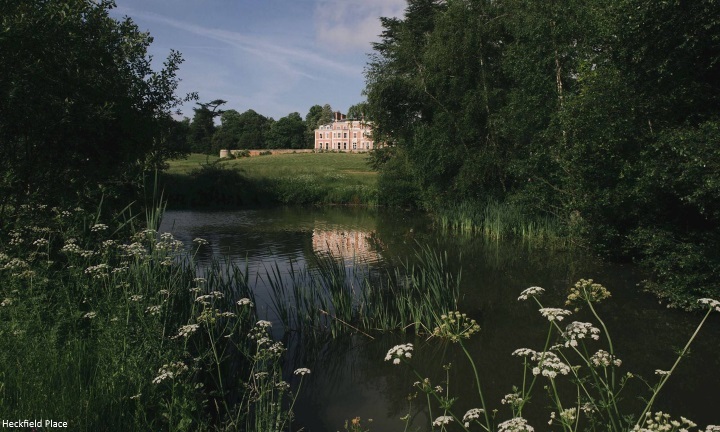 From 18th century origins to a 21st century hotel, Heckfield has been evolving for over 250 years". 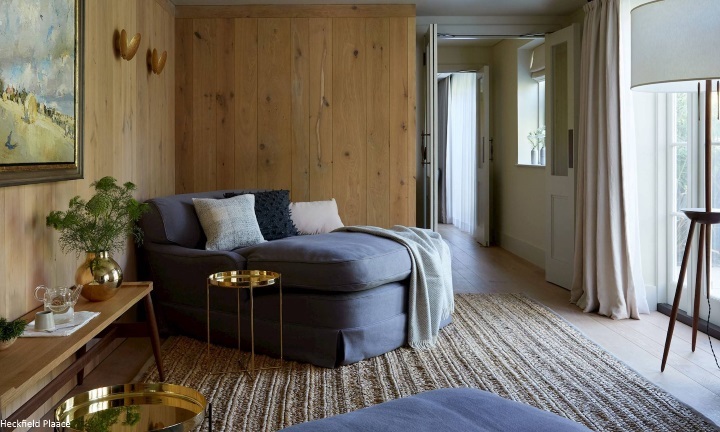 The Little Bothy spa offers yoga and pilates classes. The couple reportedly stayed in The Long Room. 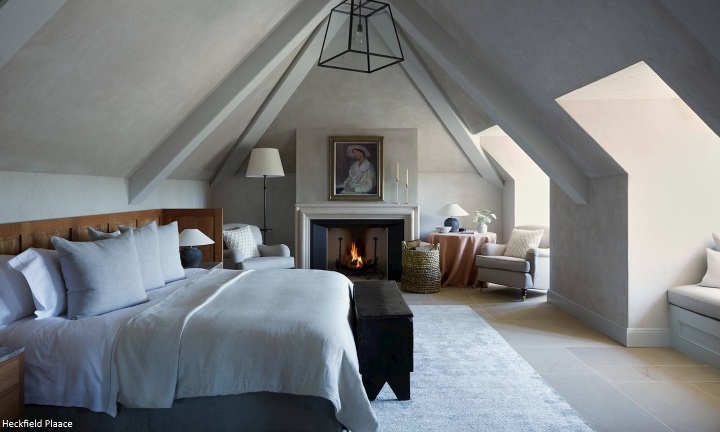 The signature suite offers a spacious outdoor dining terrace, a fully fitted English Oak kitchen, original British Art including a Virginia Woolf painting, separate sitting and dining room with an open fireplace and vaulted ceiling and exposed beams. We have the results of our royal baby polls. An overwhelming 74% of you think Baby Sussex is a girl. 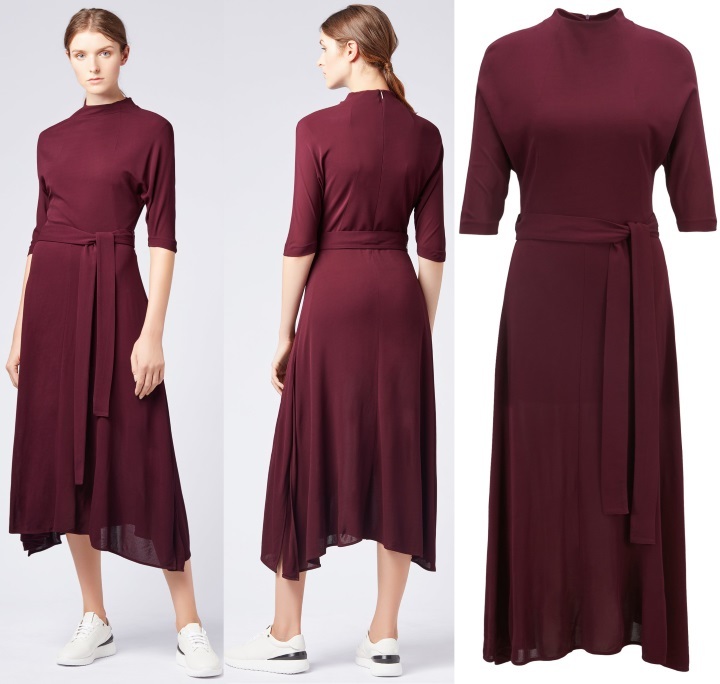 Next it's fashion-related updates, beginning with news Meghan's Reiss Azzura dress is back in stock in several sizes at Reiss (with many thanks to Meghan's Fashion for the tip). The £249 Hugh Boss dark pink Eodora dress Meghan wore in Sydney is available in several sizes. And the Reformation Pineapple Dress Meghan wore during the tour on Fraser Island is available for $218 on their website. And with that, I'm going to leave you with this video of Harry dancing with ballerinas during an engagement at the YMCA in South Ealing in support of Heads Together. There was a very sweet moment when he met an adorable baby and chatted with her mum.